Sara (my wife) is the best cheerleader on the planet. She believes so much in me that it almost makes me sick (I can’t imagine what other people think). Regardless of what I’m doing or going through, she is right there supporting, helping, or just adding her “you can do it!” two cents. I know I’m super lucky to have someone like that in my life. I’m even luckier that this person is my wife and my best friend. I attempt to be a cheerleader for her. I’m not sure if I succeed, or even get close but, I’ve found that she isn’t he only one to benefit from my cheerleading. I benefit too. Being someone’s cheerleader gets you involved on a deeper level, shows you’re interested, and gives you a different perspective. 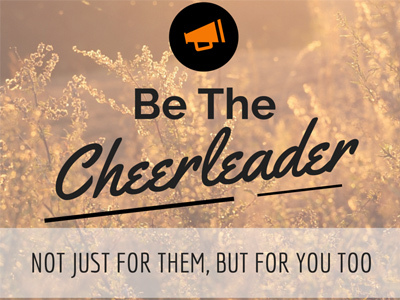 As the cheerleader you are involved, even if your cheerleading is only limited to jumping around and being excited for the other person. It is rarely limited to that though. Let them bounce ideas and questions off of you. You ask your own questions to find out more. You get involved and try to help solve problems. You’re invested in what they are doing and the results. That alone should warrant you picking up the pompoms! The questions, suggestions, playing devil’s, any way that you get involved all show them that you are interested in what is going on and in their success. Your interest makes them feel important and when it comes down to it, that is all everyone wants, is to feel important. So get interested, find out how you can help, and you’re providing something that not many people get enough of, but should. Simply put you’re giving them a different perspective, somewhat objective, and that is very valuable. This is why other people need cheerleaders, why that need to talk things out, so they can get that other perspective. That isn’t where it ends though. Many times, the suggestions I give to Sara help me in my own tasks and problems. It gets me to stop, take a step back and look at things from the other side, or at least another angle. The ability to do that has helped me with problems and my adventures many, many times. Cheerleading doesn’t have to be limited to your wife or husband, it needs to be done for your kids, your friends, and even for yourself. Being a cheerleader is one of the best things I can think of that you can do for someone else.